It is always recommended to backup your site before updating any theme or plugin. You will be notified of new version automatically. Navigate to Dashboard → Updates. 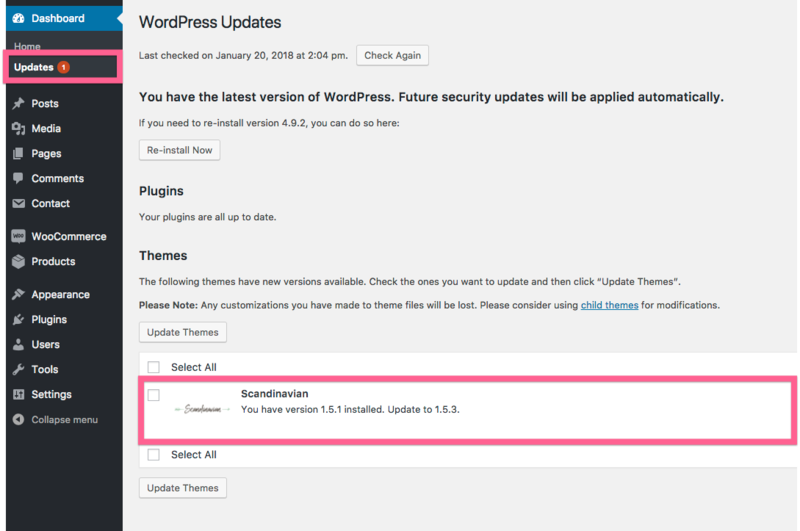 Select the Scandinavian checkbox and click Update Themes. Make sure the plugin Easy Theme and Plugin Upgrades is installed and activated. Navigate to Appearance → Themes. Click on the button Add New at the top. Click on the button Upload Theme and then Choose File. Upload the file scandinavian.zip found in the Theme folder inside the main zip file. Click the button Install Now.